You should start getting used to streets that look like this. And that’s just one-third of their summer workload. After a very successful run last year the “Better Naito” project has returned. 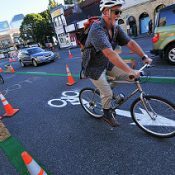 Working hand-in-hand with the Portland Bureau of Transportation and with a full endorsement from Commissioner Steve Novick’s office, Better Block has coned off the two eastern-most lanes of northbound Naito Parkway to create a temporary sidewalk and two-way bikeway. The new configuration will run through the end of July and it stretches nearly a mile from the Hawthorne Bridge to NW Davis. To help with ambience, the City announced today that this stretch of Naito now also has a 20 mph speed limit. Lower speeds and more space to walk and bike makes a lot of sense for the organizations who put on large festivals inside Waterfront Park. 15,000 people per day attend the festivals during peak season. 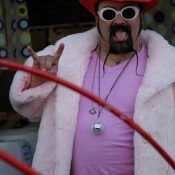 Rich Jarvis with the Rose Festival showed his support for the project at this morning’s press conference: “Just like nature abhors a vacuum, festivals abhor empty spaces,” he said. The same could be said for vibrant cities. 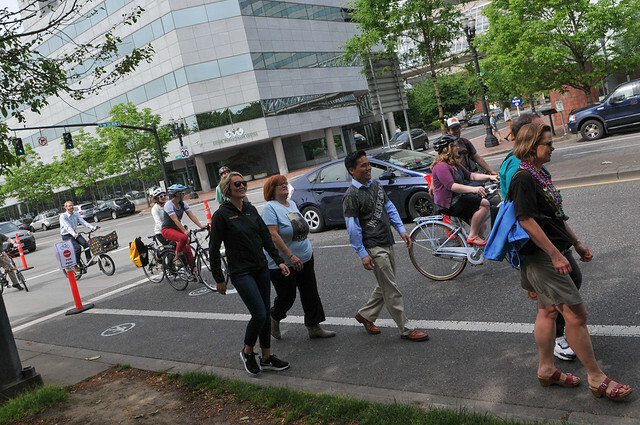 Not only is Better Naito building on momentum from last year but the concept got an unexpected boost when Portland Mayor Charlie Hales announced his budget yesterday. Making good on promises he’s made for two years now, Hales wants to spend $1.46 million for the “Naito Parkway Improvement Project.” Details still need to be ironed out but it’s generally accepted that the project will make Better Naito permanent. The funding is far from assured, but at least Mayor Hales has put a name and a dollar amount on the table. 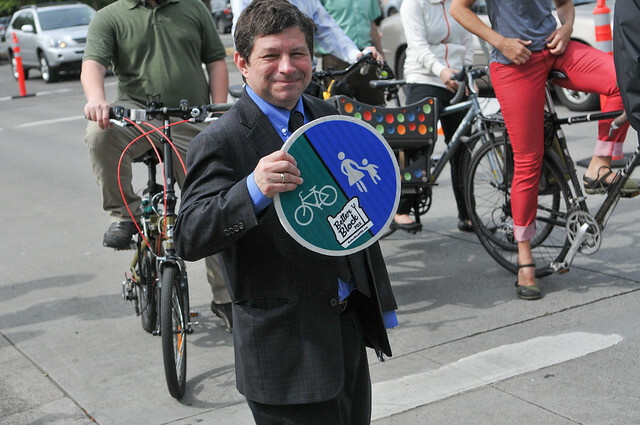 Better Block gave PBOT Commissioner Steve Novick this sign because he’s been such an ardent supporter of these projects. Portland in the streets indeed. 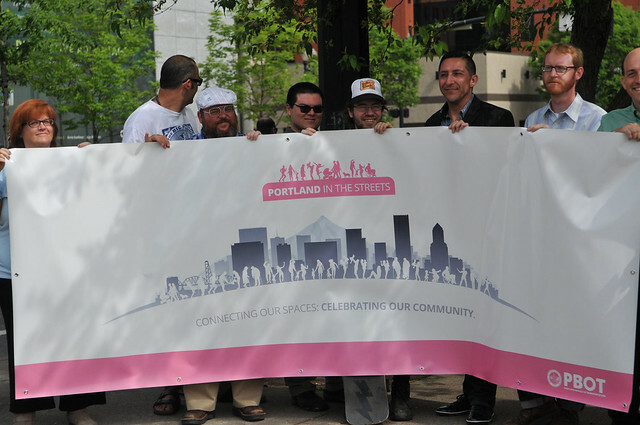 It’s a very big bite from the apple for an all-volunteer organization with much bigger ideas than budgets — but that’s often how great things happen in Portland. 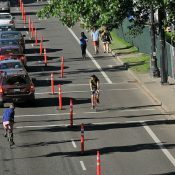 With the amount of development going in on Burnside, and the amount of time the buses spend in traffic waiting to get through the area, a better Burnside bridge will be helpful, but a more permanent solution is needed, with bus lanes from at least West Broadway to East 12th at the minimum. this naito project is needed, as is the Burnside bus and protected bike lanes. no one should die from “choking on a soda”. All we need is a wall that physically separates vehicle traffic from bike traffic. Vote for Trump, and make the drivers pay for it! 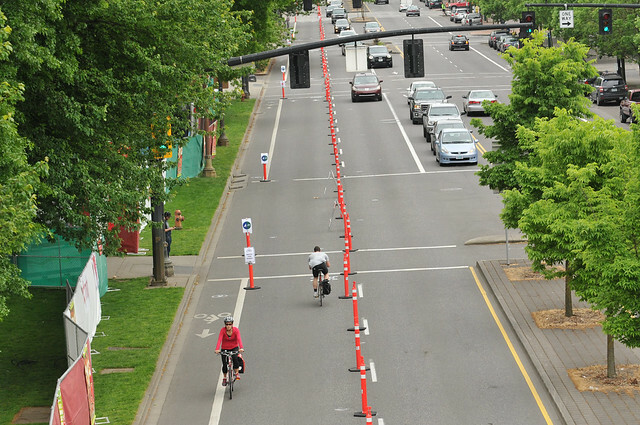 I was down there this weekend on a beautiful warm day and saw no one using the Naito lane. Interesting though not surprising, When given the choice people would rather not ride adjacent to heavy traffic. Or ride next to the water, it is prettier. True, i commute on the waterfront every day, at least twice a day. But with the festivals and fences going up, space is now about to be far more constrained. I’ll probably be switching over to Naito for the majority of the summer. What time were you down there this weekend? The lane wasn’t set up until 7pm. The Cinco de Mayo fiesta opens on Thursday (5 May) and runs thru Sunday (8 May – Mother’s Day). They are expecting big crowds there this weekend if the weather holds, especially Friday and Sunday. Friday is a Free Admission day this year. 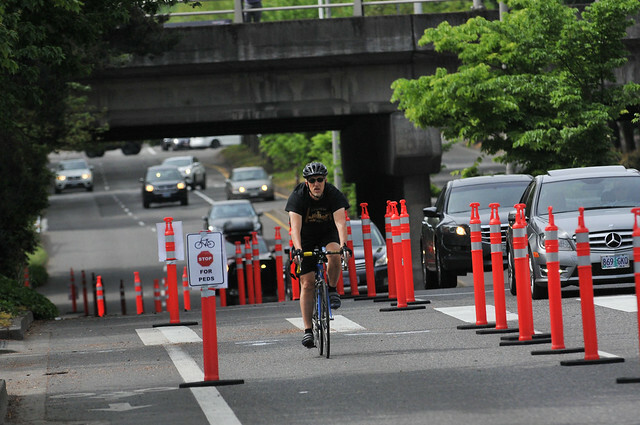 Those Better Naito lanes will get a real workout! And I like the idea of a 20 MPH speed limit along that section of the street. That should be the policy all year long! Is the 20 MPH speed new? Judging by the orange flags, it appears to be. How did they get permission from ODOT to lower the speed from 30? Maybe temporary reductions don’t need permission. I’m curious. Temporary ‘construction zone lane reduction speed limits’ don’t require permission. That photo looks horrible. There’s nowhere for northbound bicycle traffic to go. I really hope there is some reasonable separation between pedestrians and the two directions of bicycle traffic, otherwise this is no better than the waterfront — actually worse because there’s less width to share. Not ambitious enough, Natio should just be shut down from the Hilton Driveway to the Steel bridge. The street should be left as or upgraded (think Pioneer Square) for use as a festival space and the lawns left as grass year long, perhaps a few playgrounds and a skate park, bicycle skills course etc. Once removed the real estate under the bridge ramps could be built into amphitheaters and stages, again for the festivals and other events. 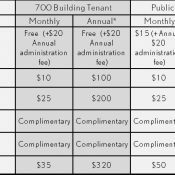 So few of the business rely on Natio for either access or parking. It could be a world class destination urban recreation,festivals, and cocerts, but instead, it’s a road that for decades I’ve wondered why it’s even there. Galleries, cafe’s, and restaurants located on the west side of the street would thrive in such an environment, as would office spaces – what tech company,well funded start up, or corporate HQ wouldn’t love to set up next to it? yeah, I would support that. If we really need the capacity of Naito (which is a possibility), let’s bury it. That would be amazing. No thanks. As we’ve seen with Boston’s Big Dig and Seattle’s Big Bertha, burying a highway is a terrible idea. The Big Dig was certainly painful, but most Bostonians that I’ve talked to think the result was a big improvement. I don’t think many would characterize it as a “terrible idea”. The Big Dig went way over budget and time. Ditto for The Alaska Way replacement, which is still ongoing. Instead of burying highways, we should just be removing them outright. I think “way over budget” might be an understatement. In Boston’s case, I don’t think removing the Artery was a viable option. Not a bad idea, but might require double to 3x the budget. then there would be the dead end streets. Maybe a 3 lane road diet with the east remainder annexed into the park, but then there are the bridge piers. I was disappointed this morning when I checked out Naito and found multiple large trucks parked in the Northbound and pedestrian “lanes” and a truck driver walking in the Southbound. When trucks park in these lanes and block them, it’s very dangerous for Southbound bike traffic. Heading Northbound, you can weave through the cones and take the vehicle lane, but there’s no chance for that when you would be heading into oncoming traffic. The only option would be to back-track until you can cross Naito and continue on the West side. Those trucks parked in the Better Naito lanes were likely part of the setup crew for Cinco de Mayo. Expect to see them there on Monday morning when they take the tents down. This is a phase 2 issue to be figured out – where event trucks load and unload, as well as Saturday Market access. Those “Speed 20 is Plenty” speed limit signs could be handy on Naito this weekend! 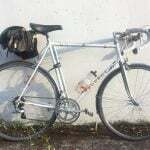 I just rode it this morning. There was a large truck blocking the entire lane at Oak during the time PBOT says the lane must be clear (7am-9am). This was at 8:15 am. There was no way around the truck without merging into motor traffic. PBOT gave people 20 hours during the day for unloading – unacceptable in of itself – and people can’t even adhere to that very generous loading window. 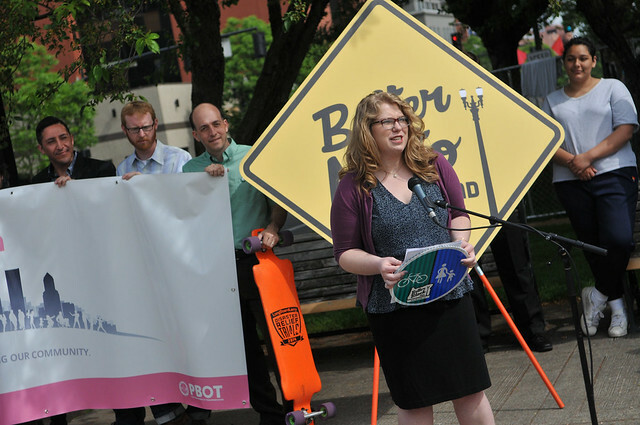 I am very concerned that without enforcement, Better Naito will not work. This also does not give me much confidence that the permanent solution will work any better. Hopefully more thought will go into that. 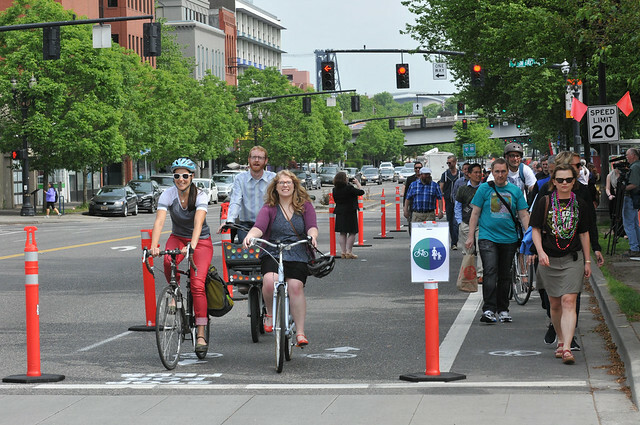 Better Naito is a terrific idea, but we need to work harder on the execution. I didn’t realize that PBOT was allowing blocking a vital traffic corridor during certain hours, what the heck are they doing that for???!? PBOT is allowing loading at all times other than morning and evening rush hours (2 hours in the morning and 3 hours in the evening). Because the new use is new and the closure of the lane for truck loading and unloading at events is what inspired the new use. The truck was still there at about 9:00 am, if we’re talking about the same one. I also encountered a non-yielding Ford pickup truck driving down the lane and was given about 1-2 feet between the truck and oncoming traffic when we passed. 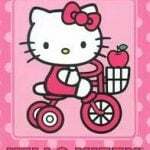 Today, I had to navigate past a semi parked, and two vans driving down the bike/ped lane this morning. 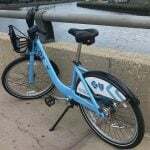 Yesterday, I was nearly hit by a car making a turn into the bike/ped lane in order to park under the Morrison Bridge! That’s a parking lot for events and Saturday Market, similar to the private one at the south end, so another thing to figure out in the final design. It would be nice to add some curb tight sidewalk along the park frontage (in the existing right of way), but guess which bureau opposes that? I agree. Converting just the single travel lane into a two-way cycleway would be tight. It would be nice to add in the existing bike lane width to the total width, then add the sidewalk to the east of the curb.